Let me start by saying that this was one of my most difficult reviews to write lately. Not because I’m feeling conflicted about Noteworthy. Not because I needed to get my thoughts in order. No, this was difficult because my heart was all “fdhjzkzhfdkjhqks” and excited and gushing all over the place and really, what are words again? So suffice it to say: I LOVED this book. I loved this so much that I finished this in a day, despite still being in the after-effects of a horrible reading slump. This adorable, inspirational and just overall fantastic book blew that slump away, just like that. It was funny, it was cute, it was relatable, it was real, it was romantic and it was just about everything I’ve been looking for in a YA contemporary. Why do I love Noteworthy so much? Let me count the ways! The plot. I mean, I have a thing for the girl-pretends-to-be-a-boy plot. I just can’t say no that that trope. Combine that trope with music, more specifically a capella, and I’m literally jumping up and down and screaming in excitement. This story has been pitched as Pitch Perfect meets She’s The Man, which are two of my favorite feel-good movies. And I’d like to add the kdrama You’re Beautiful to that list, which also features a girl crossdressing as a boy and entering the music world. Noteworthy definitely has something from all of the above, but in my view it even still exceeds all of them, because on top of the great and entertaining plot, it still has so much MORE. Which I’ll get to in my following points. A great and relatable main character. Jordan is a Chinese-American teenage girl who comes from a poor family, an all-consuming broken relationship and is struggling with a lot of things, such as moving on from her past, figuring out her sexuality and how she’s going to reach her dreams. She was such a great, well-written and well-rounded main character. I loved her personality and her dry wit made her one of my all-time favorite characters. The humor. 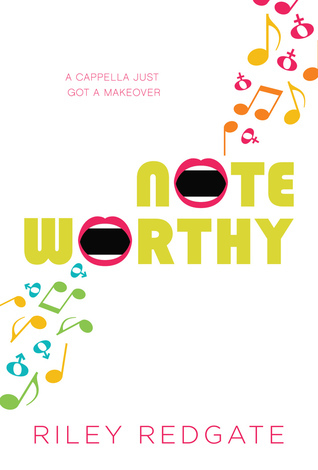 Noteworthy is so full of humor – from Jordan’s dry wit to the hilarious situations she gets herself into, to the conversations between the Sharpshooters which will have you snorting despite yourself. The diversity and representation. Where do I begin? There is so much diversity in all sorts of ways, from different races to different sexualities, and a lot of important topics get raised. Jordan’s crossdressing gets her to guiltily but also respectfully consider the big differences between what she’s doing and what transgender people struggle with. But it also touches on topics such as the narrow confines of femininity, the American health care system and education/ scholarship system, biphobia, … All of these important topics get adressed throughout the book in a respectful and natural way. The friendships. I just totally saved the best for last. Not to say that my other points are not amazing and worth gushing about, but there’s just something about epic friendships and group dynamics that gets my heart fluttering. I ADORED the friendships in this book. The Sharpshooters are such a real, amazing and fun group of friends. They have their issues and their fights, but despite their many differences they also have eachothers’ back and are there for eachother through it all and it was so awe-inspiring to watch. Not to mention the hilarious group chats! Overall, I think I have reached my limit for the moment of speaking coherently about this lovely book. Read this if you need a boost. Read this if you need a laugh. Read this if you want real, relatable characters. Reads this if you love epic friendships. Read this if you love music. Read this if you even remotely enjoyed Pitch Perfect, She’s The Man or You’re Beautiful. But for whatever reason, I can only recommend you to read this. Have you read Noteworthy? What did you think about it? This sounds so good! I mean, who doesn’t love Pitch Perfect? I really love the quotes you picked out. That first one about favorite books – I mean, isn’t that how we all feel as readers? And I really like the one about feeling awkward about femininity. I can relate to this one a lot, I’m not a girly-girl and I feel really awkward about a lot of girl things, like makeup and dresses. I loved this one too!! So many things about it were great and I think you hit them all!! Glad you enjoyed this too. Great review!! I definitely want to read this one. It’s been on my wishlist for a while now so I’m definitely going to need to scoop it up soon. It looks like it has so many things that I love in stories: great friendships, diversity, great main character…and who doesn’t love a book with some humor. Great review! Thanks so much, Julie! If you love all those elements, then I don’t think you could go wrong with Noteworthy 🙂 Hope you’ll enjoy it when you get to it! This book definitely has been getting a lot of rave reviews, but I can only agree wholeheartedly with them 🙂 Thanks so much! It was amazing! And yes, I loved how it discussed all those important issues while still being cute and fluffy and not sounding too preachy. Thanks so much Lauren! I’d definitely recommend to pick this one up! I also picked it up because of so many rave reviews everywhere and I can only agree completely with them 🙂 And ESPECIALLY if you’ve been in a contemporary mood, I think you’ll really enjoy this one.